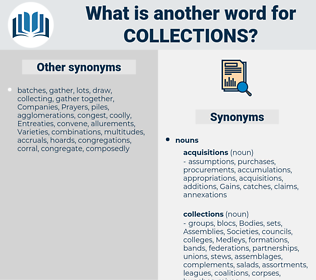 What is another word for collections? compilations, exhibitions, Selections, congregations, combinations, Libraries, suites, repertoires, books, ensembles, bundles, sets. archives, packages, Assemblies, pools, Perceptions, recoveries. accessions, Les, income, approximate, Recipes, Patents, memberships, CRS, perception, Perceptions, recovery, recoveries. 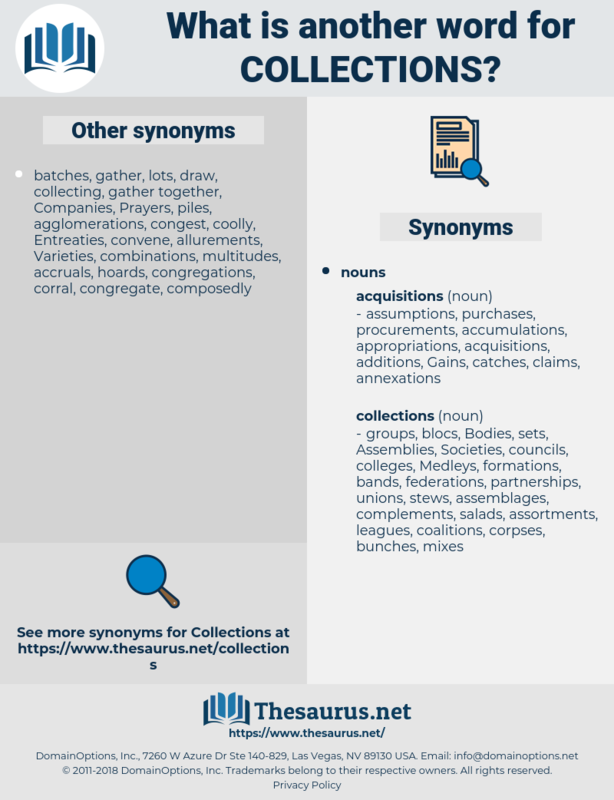 catalogues, contingents, contributions, institutions, archives, belongings, Associations, collectibles, collectively, allocations, memorabilia, deductions, acquisitions, Coins, Constituencies, Compendiums, factions, coverings, aggregations, donations, Inventories, exhibits, portions, impositions, extractions, possessions, repositories, documents, tabulations, coatings, complexes, museums, Pooling, relics, Resources, titles, volumes, Incomes, proceedings, costumes, gathered, Commodities, papers, Communities, initiatives, clinics, pieces, materials, Records, transfers, Populations, receivables, fonds, holdings, assemblages, clothes, liftings, Foundations, datasets, samplings, gifts, listings, assembles, Levied, codes, letters, Directories, inflows, services, Indexes, enclosures, assets, species, returnees, folders, scanning, items, monies, tools, understandings, references, stacks, removals, Databases, proceeds, catches, sequences, Cropping, Registries, works, together, perspectives, notebooks, clusters, takings, inputs, minds, panels, accounts, blocs, Animals, groups, clerics, coverages, examples, bands, rooms, cultural, banks, ranges, registers, Attitudes, giving, estates, views, menus, units, objects, episodes, Quantities, militants, rulesets, debits, drawdowns, blocks, withdrawals, sources, supplies, manuals, designs, repertories, Charges, albums, packages, rosters, parts, Assemblies, findings, numbers, segments, assessments, serials, earnings, uniforms, batches, basics, insights, senses, Beliefs, casebooks, Measurements, Entries, captures, yields, Activities, Grants, Ones, amounts, pools, garments, funds, landings, individuals, streams, packs, expenses, arrays, digests, flows, eyes, baskets, Taxes, Fees, sums, crops, abstracts, products, LINEs, Standards, Classes, Rallies, harvests, bills, claims, caps, swabs, Drives, norms, Harvested, drawings, Cues, Cribs, builds, waves, returns, squads, rounds, Plays, birds, accessions, Bases, feelings, prosecutors, runs, specimens, Recipes, Perceptions, collected, recoveries. specimen, specimens, collect, collects, gathering, collected, collector, gather. collectors, gatherings, gathers, meeting, meetings, collects. Other semi - scientific nature - writers will doubtless appear in most collections of children's books - and may do no harm. I have not taken any collections for this year."